I just love this time of the year. Christmas celebrations are over and all the pressures of getting ready to that point are done and over with - Christmas shopping, coordinating schedules to party invitations, cake and cookie orders, etc., etc... Don’t get me wrong, I loved going thru all that but like any self professed introvert, I like down times even better. Yes, but party time is not over yet! The New Year is ringing up soon. I like celebrating New Year’s though. There’s no pressure of giving a gift, you can celebrate it as quietly or loudly as you wish. There is something about welcoming the New Year that signals a new beginning, a fresh start. Around this time of the year I sit down and reflect what the passing year has been for me and I become pensive for what I want for the coming year. 2013 had been an eclectic mix of experiences for me – there were (lots of) laughter and (some) tears, personal challenges and triumphs, beginnings and endings. As a cake decorator, I believe I made the most cakes this year and I was able to learn and try a lot of new designs and techniques. As for this website, looking back to the past year, I could have posted more and shared more cakes that I had made. So this coming year, you will see more of me, hope that’s ok with you. I plan to post more cakes and tutorials and start making videos again. And oh there’s also other exciting things lined up in the horizon, but I can't talk about it just yet. Wow, such a long post, now let’s party on! 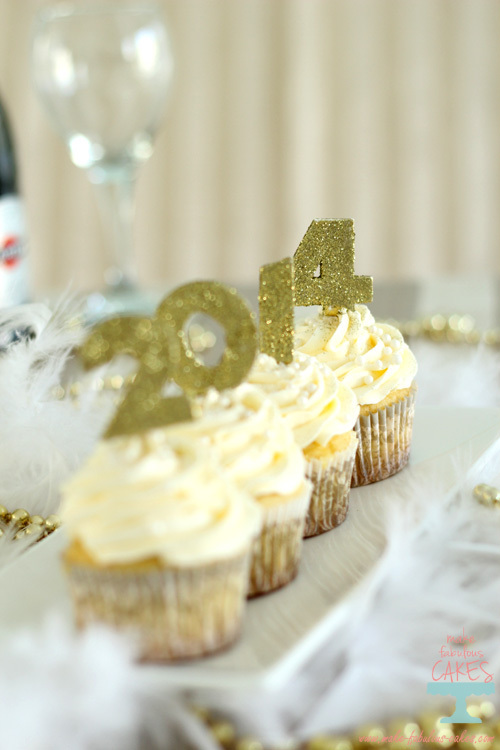 Let’s celebrate this coming New Year with this Champagne Cupcakes! Everything was flavoured with champagne here, ok I actually used sparkling wine (Asti Martini) and prosecco is fine to use too. Save the champagne for the actual toasting and just use something cheaper. But let’s use the term champagne here, because it sounds more indulgent! 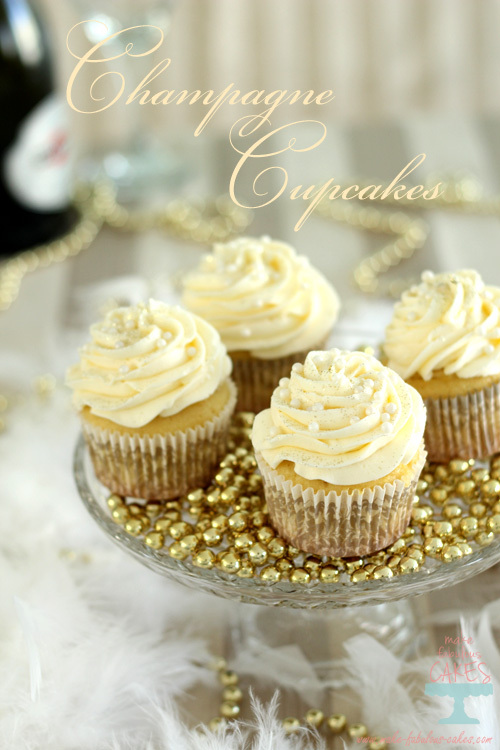 The cupcake has some champagne added though there is just a hint of flavor in it. 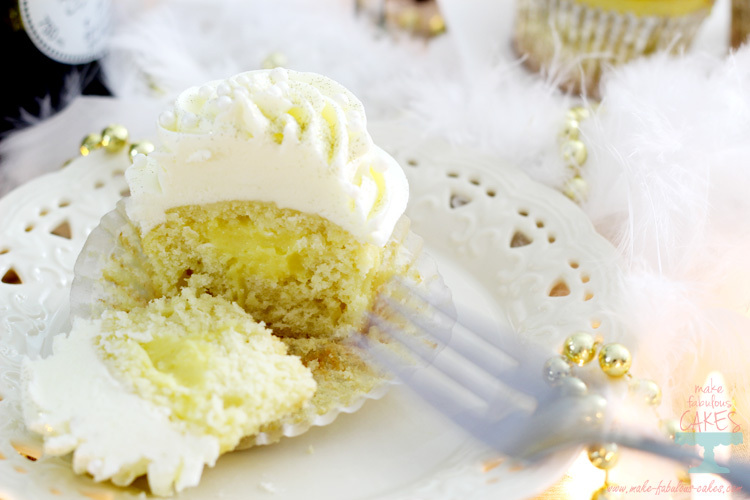 The cupcake is then filled with champagne pastry cream, and topped with champagne buttercream – my favourite part! 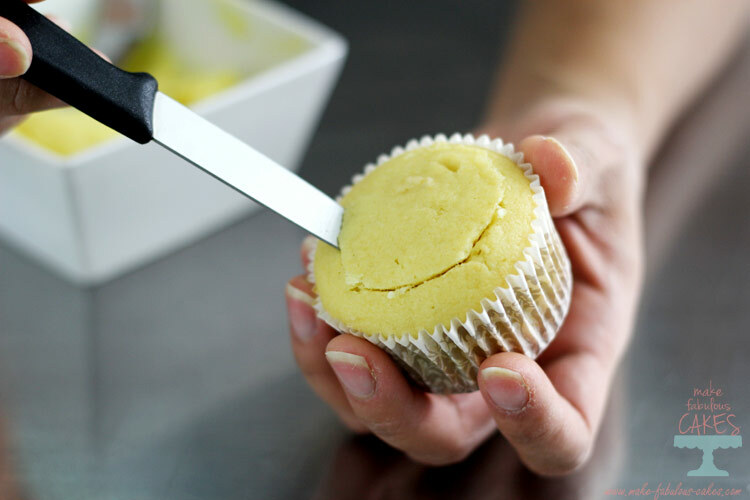 To fill the cupcake, cut a cone shape using a small paring knife. Cut it on an angle, take it out and trim the bottom part of the cone to make it flat. 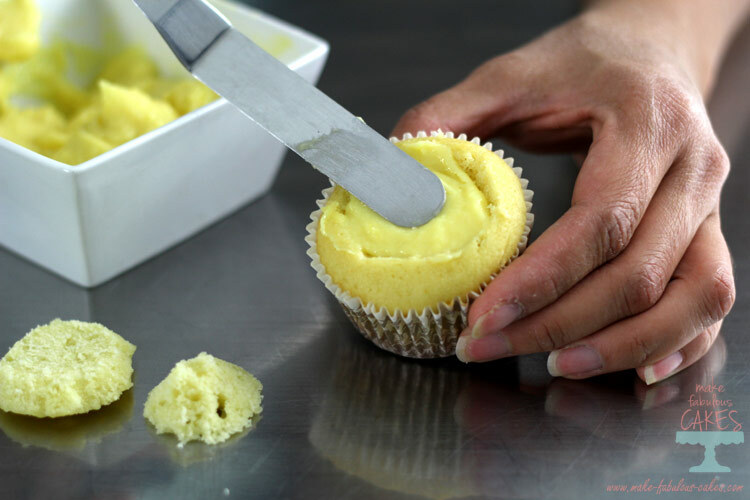 Fill the cupcake with pastry cream and put the cover back on. Now it’s ready for frosting. Mix flour, baking soda, baking powder and salt in a large bowl. Set aside. In another bowl with a mixer, cream butter and sugar together for about 2 minutes. Add eggs one at a time, mixing it in after addition of each. Add in the vanilla. In another smaller bowl, mix together the sour cream and champagne or sparkling wine. It might curdle up a bit but it’s fine to use. Stir the flour mixture alternately with sour cream/champagne mix, beginning and ending with the flour mixture. Scrape down the sides and beat for another minute. Whisk together ¼ cup of the heavy cream with cornstarch in a small bowl. Add the egg and eggyolks and whisk until well mix. In a saucepan, mix together the rest of the heavy cream, champagne and sugar and heat until just about simmering. Watch it carefully as it may bubble over. Pour about a third of the boiling mix into the cornstarch/ heavy cream mix. Whisk it very fast so it will not curdle and get cooked. Now pour this back into the rest of the champagne/heavy cream mix in the sauce pan. Constantly mix it with a whisk until it is thick. Make sure it has boiled to about a minute so that the cornstarch will be cooked. Once it has boiled for a minute, take it out of the heat, mix in the butter and vanilla. Pour into a shallow dish and cover with plastic cling wrap and let cool in the refrigerator. Cream butter with a whisk, add confectioner’s sugar and mix it very slowly at first. When well mix, beat it faster until thick and fluffy. Add champagne one tablespoon at a time, mixing it in after addition of each. Frost cream filled cupcakes. Decorate as desired. 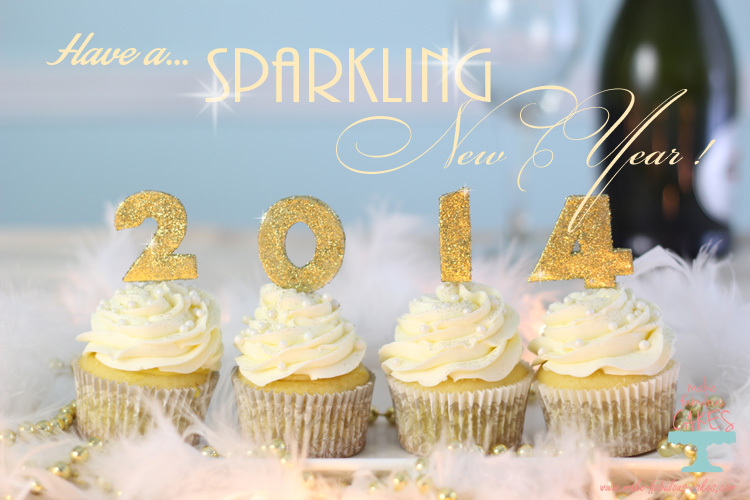 Enjoy and have a sparkling, happy New Year!